Substitute values into algebraic formulae. Explain the use of letters for numbers, the difference between a constant and a variable, and understand that the letter only represents a number and that exactly what it represents should be clearly defined. Translate a simple situation into an algebraic expression. Identify and collect like terms. Use and design one step number machines. Use and design two step (or more) number machines by combining two or more one step machines. Create an inverse function machine for simple one or two step machines. Use the concept of balance to solve linear equations. 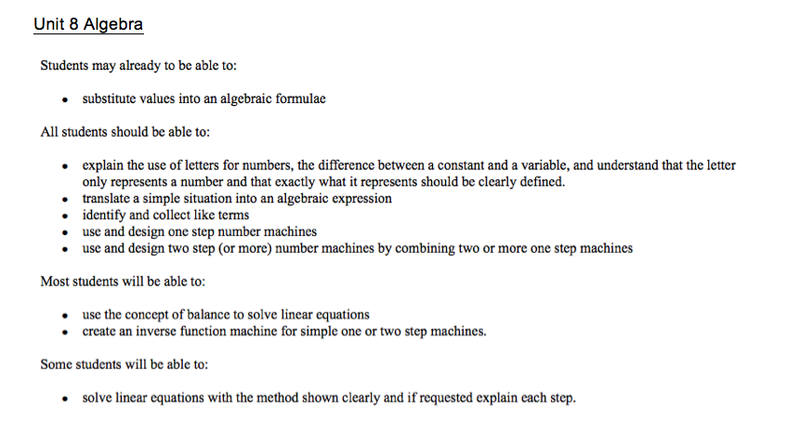 Solve linear equations with the method shown clearly and if requested explain each step.